One of the UK’s leading hotel management companies, M&T Hotel Management, have been appointed by Terrace Hotel Limited to manage The Crowne Plaza Edinburgh. M&T manage over 25 hotels across numerous well-known brands as well as a variety of fine independent hotels. 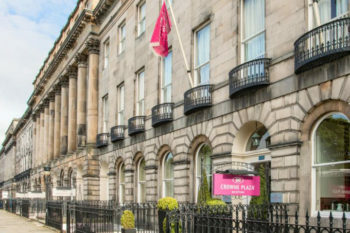 Peter Hales, Managing Director, said: The Crowne Plaza Edinburgh is an exciting addition to our growing portfolio and marks our first venture into the Edinburgh market. We are looking forward to working with the hotel team led by General Manager Robert Glashan to drive Profit for the Owner. Located just a short walk from the Royal Mile and 25 minutes’ drive from Edinburgh Airport, the luxury four-star hotel offers elegant accommodation in Edinburgh’s city centre. Housed in a row of Georgian townhouses, the hotel has 97 stylish rooms, with complimentary WiFi throughout. Crown Plaza Edinburgh boasts a modern Terrace Restaurant which opens onto a private garden, a trendy lounge bar and an indoor pool. Formed in 2009 by Sir David Michels and Hugh Taylor OBE, Michels and Taylor have quickly become one of Europe’s leading hotel management, asset management and advisory companies. With an extensive portfolio and client base, the company is a one-stop shop for investors of hotels across Europe looking to enhance profitability.